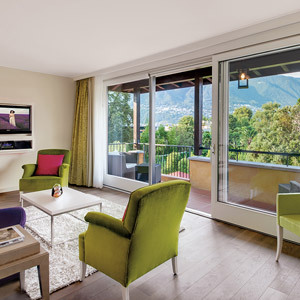 Elder sister to the smaller, more contemporary Giardino Lago, Giardino Ascona is where you go for something just a touch more classic on the shores of the Swiss end of Lake Maggiore. Here owners Daniela and Philippe Frutiger combine the elegance of Alpine lakeside hospitality with a laid-back Mediterranean influence, which comes with the territory here in the Ticino, the Italian corner of Switzerland. It’d take an architectural historian to explain how exactly this classic villa differs from its counterparts over the border — suffice it to say that for the rest of us it’s a slice of unadulterated dolce vita. 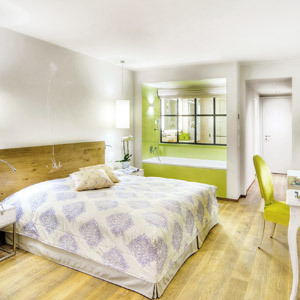 The rooms are renovated in a style that’s a touch more modern than the hotel’s classic exteriors, and there’s a stylish spareness to them, as well as a certain rigor to the color palette, that’s eminently pleasing to the contemporary eye. Comforts, too, are modern, with wi-fi and electronics alongside the low-tech charms of the views from the balconies and terraces. An indoor and an outdoor pool, as well as a spa and fitness center, await leisure-minded guests, and Ascona’s golf club is literally next door — to say nothing of the lake itself, whose shores lie just at the end of the road. And you’ll want to be sure you work up an appetite — Ecco Ascona is the proud recipient of two Michelin stars, and Aphrodite, alongside the lily pond, is the more modern and casual option. How to get there: Giardino Ascona is approximately 120 km by car from Milan-Malpensa Airport via SS336, A36, A9/E35, A2, and A13. 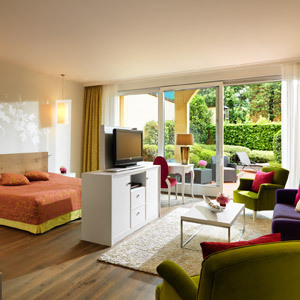 Alternatively, the hotel is approximately 220 km by car from Zürich Airport via A4/E41, A2/E35, and A13.